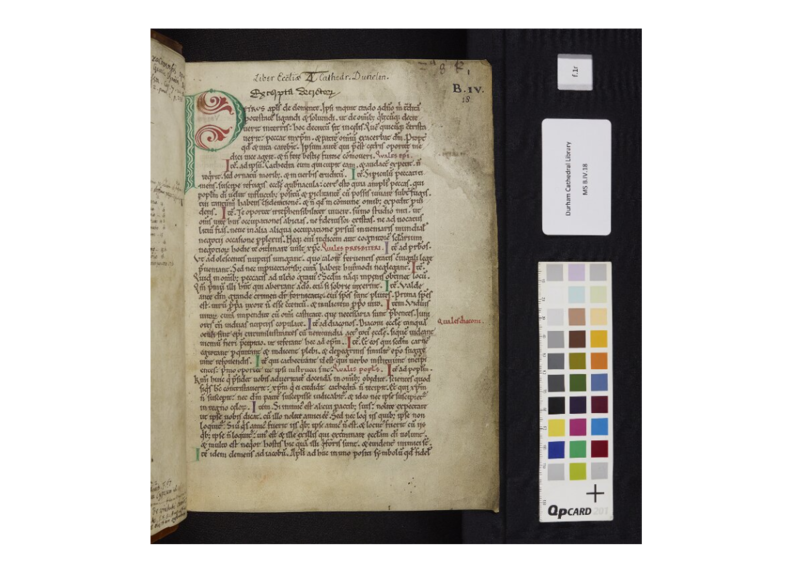 The Priory project has followed the IIIF standards for making our images of Priory books as open and usable as possible. 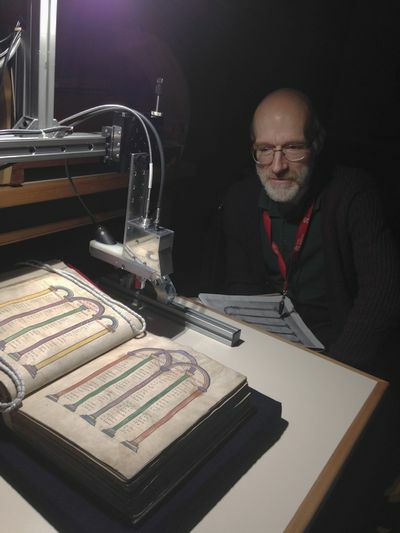 In return we have already gained many benefits, not just from sharing technology but also access to Priory books held and digitised by other institutions. Part of working with open source software and standards is the obligation to participate in their development: simply using them helps to spread the influence and build their reputation, but where possible it is important to contribute towards development. As creators and end-users of the project infrastructure we can identify different requirements which may not be apparent (or at the time relevant) to others. When talking about the origins, creation and subsequent use of books there is a need to be able to take the audience to a particular place on a specific page of a book to illustrate the point. This has been difficult so far in IIIF: at best a browser-specific solution got you near, but there wasn’t a part of the standard that combined the precision of the image api (here is the part of the image to look at) with the scope of the presentation api (here we are at a page within a book). So when a new IIIF api was announced for content state – “to describe a standardized format which enables the sharing of a particular view of one or more IIIF Presentation API resources” – it seemed that a solution was available, a neutral way of expressing the specific target within the image within the book. In section 4.1 the api defines the correct way to express the resource in JSON, so all that was needed was to build a tool to create the JSON and enable a browser to use it to perform the required action. most of this is boilerplate, but lines 6 and 9 are significant and require input. Three values are required: the manifest, the canvas and an area on that canvas defined as xywh coordinates. Any viewer displaying a page will know the manifest and canvas ids, so retrieving them is straightforward, all that is required is a means of identifying and storing the xywh values. An existing tool https://bl.ocks.org/mejackreed/6936585f435b60aa9451ae2bc1c199f2 provided this function, so could be adapted to provide access to the three required variables. 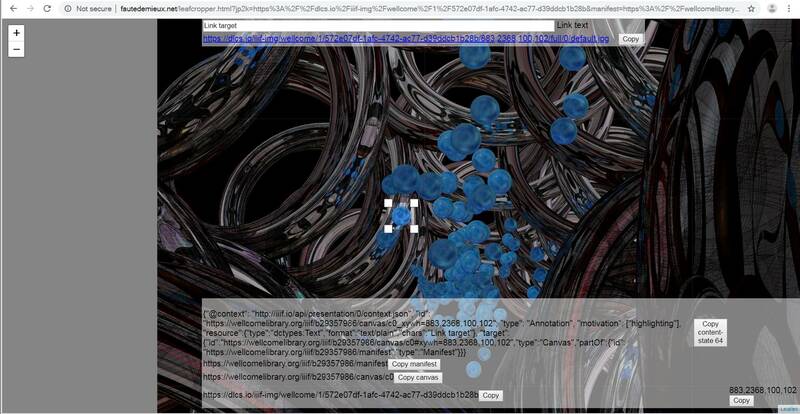 Added to a means of browsing manifests, this can be used to navigate to the relevant image with a tool like http://fautedemieux.net/DULIIIFimager.html?2=https://iiif.durham.ac.uk/manifests/trifle/32150/t1/mh/m5/t1mhm50tr805/manifest here clicking on either image cropper button gives access to the image. For another example, using an image hosted by the Wellcome Institute, an artist’s interpretation of designer DNA channels which selectively transport cargo through a biological membrane (CC-BY Michael Northrop/Wellcome Images). In the picture there are a lot of blue balls (the image has been chosen as one I have no technical knowledge about). If one of them is significant and I need to draw attention to it, then something along the lines of fifth one down third one from the left is probably inadequate. Drawing a box around it is a more reliable means of getting the right one. The other half of the task is to process this in a viewer and display it correctly. There are several viewers available, and the point of the api is that this will work with any viewer, but we needed to start somewhere so decided to add the feature to our existing Mirador viewer. We use a modified version of Mirador 2: as development on Mirador 2 has now ceased and work is well under way on Mirador 3 it was easier to work with the production version 2 rather than 3, but it was clearly not worth doing too much work on an about to become obsolete version. What we could establish was a demonstration of the way it could look and work that would make adding it to Mirador 3 easier later on. In the next few months and years you may see more and more information on pigments available on the Durham Priory Recreated website. 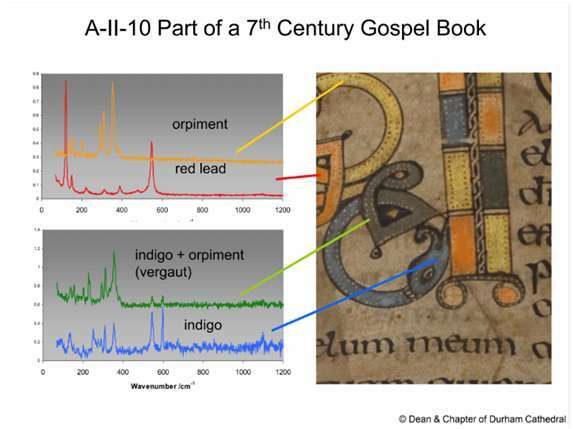 Collected by ‘Team Pigment’ – a group of chemists and historians from Durham and Northumbria Universities – this information aims to tell the viewer which exact pigments or dyes were used to create the splendid illustrations contained within the manuscript collection. In this blog post I try to answer the question of why ‘Team Pigment’ has such an interest in this research. 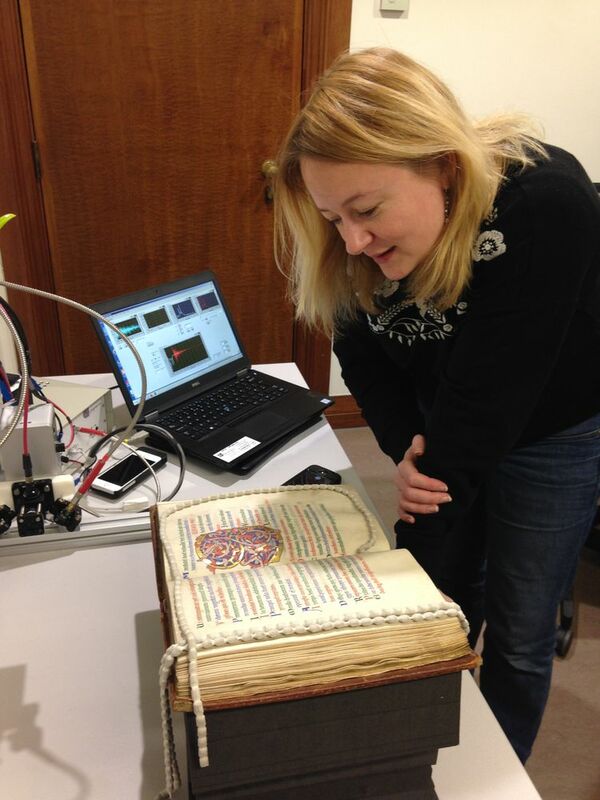 In the past few centuries, scientific techniques have been employed to understand further the technology that was employed in the making of these magnificent books. 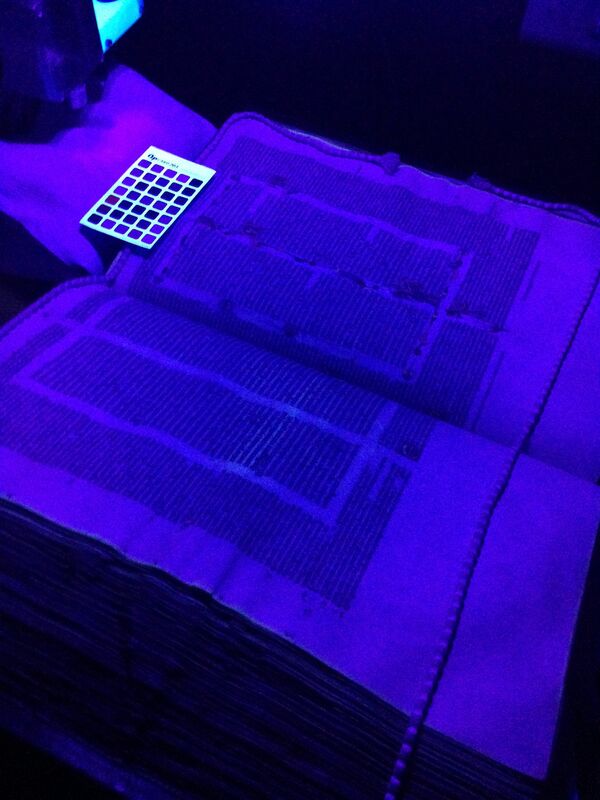 At first, the field was invasive – samples were taken, books were unbound, and parchment was cut. Some nineteenth century scholars even employed strange methods to learn more – in one case tipping strongly brewed tea onto the surface of a manuscript in an effort to reveal the secrets that lay beneath the surface! However, these techniques have thankfully been recognised as damaging and detrimental and now there are an increasing number of non-invasive analytical scientific techniques that can be employed. Durham Cathedral Library, MS B.IV.18, written in the early twelfth century, begins with what canon law scholars call the ‘Canterbury Abridgement’ of Collectio Lanfranci, which would be the canonical collection Lanfranc of Bec brought with him to England and dispersed whilst Archbishop of Canterbury (1070-1089). This manuscript and the other one that contains the abridgement, Lambeth Palace MS 351, were written at Christ Church, Canterbury, based on palaeography. 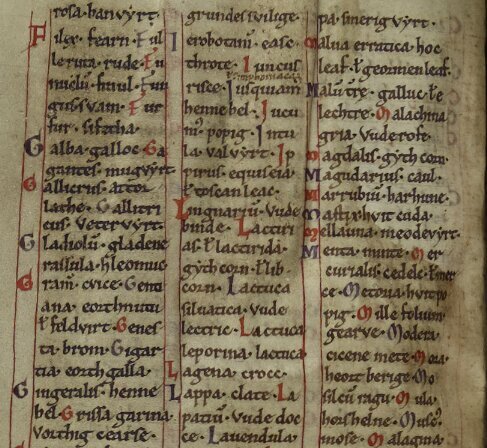 The abridgement is followed by a selection of letters from Gregory the Great. As Martin Brett has discussed (see bibliography at bottom), the Canterbury Abridgement is not especially useable. The excerpts from papal letters and conciliar canons all just run together with no headings to help guide the interested reader. Not only this, I would also say it is not particularly useful, not, at least, the way we might expect a canon law book to be used by a reader. Living in an age of reference works, handbooks, and manuals, we expect an abridgement of Lanfranci to be something that someone could take up, skim through, and find interesting bits of canon law, perhaps to help him in an upcoming trial or to sort out whether he could marry his deceased brother’s widow. Unfortunately for such a reader, not only is the Canterbury abridgement entirely unsuited to this task, it is likely to be completely useless, including as it does such unhelpful pieces of church regulation as Leo the Great’s statements on what to do if someone has been captured by pagan barbarians and forced to participate in feasts in honour of pagan gods. My hypothesis is that the Canterbury Abridgement is not canon law. It is theology. It is very common to say that canon law did not exist as a separate discipline from theology before Gratian and the rise of the schools of law, starting in Bologna in the mid-1100s. Yet we continually treat the pre-Gratian canonical collections and the body of church canons as ‘canon law’. Perhaps this is the wrong way of going about it. The first step in testing this hypothesis is actually reading all of the Canterbury Abridgement (I’ve yet to do this). The second step I have already taken — considering the rest of the contents of the manuscript. These contents are what made my hypothesis arise. After the regulatory material, which also includes the Concordat of Worms (1122), DCL B.IV.18 includes the Cena Cypriani, which is a long, biblical allegorical amusement piece, the Canterbury Forgeries, Hugh of St Victor in a later hand, excerpts from Augustine, then more ‘canon law’ material. What does all this regulatory material have in common with the Cena and Augustine? Iustitia and rectitudo — these are part of the divine oikonomia, are they not? And they are meant to be part of the human oikonomia operating out of divine gratia. 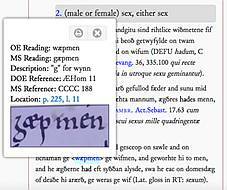 What that means in the context of this manuscript — that remains to be seen. Brett, Martin. ‘The Collectio Lanfranci and Its Competitors’, in Intellectual Life in the Middle Ages: Essays Presented to Margaret Gibson, ed. Lesley M. Smith, Benedicta Ward (London 1992), 157-174, at 161. Evans, G. R. Law and Theology in the Middle Ages. London, 2002. Wei, John C. Gratian the Theologian. Washington, D.C., 2016.